Date posted: April 24, 2014 by: JasonDarkX2 Category: Gaming Reviews 4 comments. 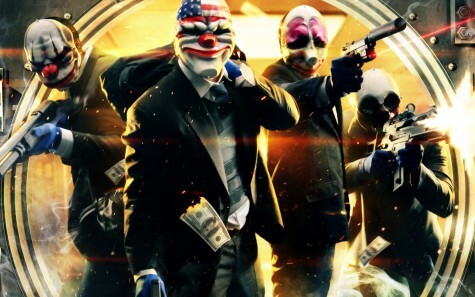 Everyone’s favorite Bank robbers in suits and clown masks are back in their non-stop door drilling, bagging loot game Payday 2 a sequel to Payday: The heist. A four player co-op based objective first person shooter revolving around players playing as four infamous criminals: Dallas, Hoxton, Wolf, and Chains pulling off heists and various robberies while taking hostages, fending off waves of increasing difficult cops, and bagging lots of loot. Released back on August 13, 2013 for PC, Xbox, and PlayStation 3, Having picked this one up after a nice free to play weekend experience on Steam, racking up 200+ and count hours of game time for the last several weeks and counting since purchase, it’s certainly worthy of a review. But the real question is Payday 2 still worth pick up after several months of it releases you might ask? For a base price of $29.99USD you’ll be getting a solid game. But If you’re sitting in front of a computer looking at payday 2 Steam sale for $9.99 or less while reading this review months down the road. Then get the best out of Payday 2 consider picking it up on PC and avoid the console version if you can. With already 26(at the time of this review) patches added new content and various improvements/fixes for the game,5 optional DLC packs, and lots more coming to the PC version. While the console counterparts are still left behind untouched. The PC version of Payday 2 is no doubly should be the preferred choice for the best payday 2 experience. Seriously this game is already at 29GB with updates on PC when initial release install was 9GB. While updates and DLC for console version isn't out of the question, it certainly going to be quite a wait. What makes Payday 2 so repayable is largely revolving around its random number generated (RNG) gimmick. While the mission structure remains the same, everything else such as amount guards, cops, camera, assets and mission objectives spawn in a different spot each time you play a heist. Making it dynamic and repayable with a different experience each time you play encouraging you to adapt to new situations. Not only is the mission's setup are random the customization let you get such as masks, patterns, materials, color, and weapon attachment are random earned through end heist card drops. Seriously having played 200 hours I’m still getting new heist setups which I haven’t played before. The random card loot has been on my side while still occasionally getting useless $40k cash bonuses even after successfully looting 4 million from a Bank heist. Surely the random system is the incentive that either keep you playing or frustrates you enough to stop. Either way there is something in Payday 2 that keeps you addicted for a while whether it’s the loot system or simply the satisfaction of a successful heist. Payday 2 is mainly built for 4 player co-op play, while there is an offline single player mode with 3 bots. It feels more like a chore while playing solo to do all the basic task that bots can’t. For example interact with things such as controlling civilians, interacting with drills, deposit boxes, and loot bags when playing alone. Since Bot buddies more as a meat shield and medic that almost always there to revive you while online and offline. Hell even cops AI are better at moving loot bag and turn off the drills; honestly bots can’t fix the drill. Out of the default 13 available heists most are do able solo on normal difficulty, anything over very hard would require 2 or 3 more players. Payday 2 is simply a game meant to play with others, best played with friends; otherwise public matches experience varies depending on which end you get. Generally heists usually have two approaches either stealth or go out loud. Half the heists available are stealth able where as some heist is the only option to go loud. With that said if you don’t like stealthing, all missions are playable in loud with guns blazing, going all out with guns blazing makes for a lot faster intense game play. While going stealth is a slower paced which doesn't involves cops as long you’re able to keep civilians under controlled thus rewarding more XP in the long run. But is it worth it each to its own. I personally go fist pump when successful stealth a heist with 3 random people. Surviving an intense police assault on overkill/death wish difficulty surely gets the heart pumping. Successfully completing a heist in either or sure brings sense of accomplishment while playing Payday 2. What Payday: the heist lacked was a good player customization/progression system; well Payday 2 simply does it extremely better. Payday 2‘s in depth customization mechanic allowing you to spec your character in an RPG like manner. You can customize your guns, your masks, and load out. With a 100 experience levels racking up a total of 120 skill points for you to use invests on for your character in either of the four skill tree: Master mind, enforcer, technician, and Ghost where each skill tree determines how you want to play investing in Mastermind means you will be able to be a medic, that can also provide addition skill bonuses for teammates and has more control over NPCs via shouting. Enforcer grants you the ability to take and output more damage while also resupplying teammates. Technician is a demo man packing firepower and trip mines making getting through doors and safes with ease. Ghost tree is all about moving fast and stealth. With that in mind and since you aren't bound to one tree you can easily invest into something that suits your play style that contributes to your crew. Overall Payday 2 is seriously a very well built repayable that is constantly being updated with free or paid content, that’s if you’re on a PC. By the time you read this review Payday 2 might have several updates if not lot more DLCs. While I’d recommend playing it friends if you’re just staring out, online experience in public matches with 4 strangers may vary. With that aside Payday 2 makes a very good contender for an excellent action co-op game that is worth checking out. Final verdict would be 8.1/10 totally recommend picking it up on steam sales. op game to be played with friends. Better customization option than Payday: the heist. Almost never run out of things to do. Paid DLC heists don’t separate community. You can play them without owning them, just can’t host. Online matches aren’t exactly Noob friendly sometimes. Not built sole for solo play. op not Pvp unless that a thing that bugs you. Might become repetitive if played too much in a short time span. I bought this and love it night club is my favorite heist. Great review convinced me to get it. I finally bought payday 2 from a sale couple weeks ago and I can’t stop playing it. Although the community is not Noob friendly, finding friends on Steam forums is a ease.